(CBS) Charla Nash is showing off her new face two years after a friend's pet chimp attacked her, ripping off the Connecticut woman's nose, lips, eyelids, and hands and leaving her blind. 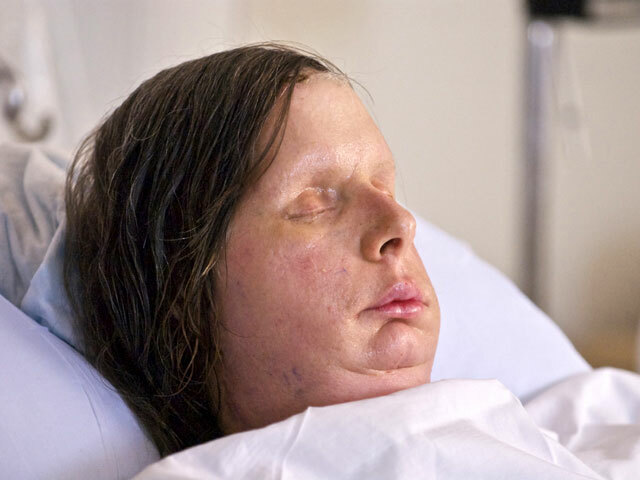 A photo released by Brigham and Women's Hospital in Boston, where Nash underwent face transplant surgery in May, reveal a startling transformation. And the change in Nash's appearance seems to mirror a change in her outlook. "I will be able to smell," Nash said in a written statement. "I will be able to eat normally. I will no longer be disfigured. I will have lips and will speak clearly once again. I will be able to kiss and hug loved ones." Nash had also been given hands at the hospital, but those had to be removed because of complications. Still, she was upbeat about her prospects for a complete recovery. "Losing the new hands is just a bump in the road of my recovery," she said. "I believe that one day I'll have two hand to help me live as a blind person with confidence.